Everyone in fashion seems to be jumping on the athleisure bandwagon these days to create workout-inspired clothes that are as chic as they are functional. 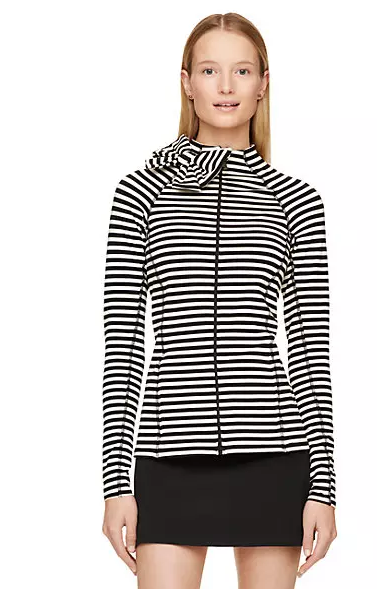 Kate Spade is the latest brand to release an activewear line in collaboration with Beyond Yoga. The Kate Spade New York and Beyond Yoga capsule collection consists of workout basics (think bras, camis and leggings) in bold strips punctuated with punchy fuschia and lots of cute signature bow detailing. The line ranges in price from $80 to $178. As of now, some pieces from the Kate Spade New York and Beyond Yoga collection is available on katespade.com and beyondyoga.com. The collection is also set to retail at select specialty stores and boutique studios starting this month.